What Are Income Riders and How Do They Work? Income Riders Are Optional Enhancements To Variable and Fixed Index Annuities. Once upon a time, the only way you could guarantee yourself a lifetime income from an annuity was to "annuitize" your lump sum principal and turn it into a series of payments. Upon doing so, you would lose access to your principal. This was never popular, which led to life insurance companies creating a "workaround" in the form of a rider that you can add to your annuity. This rider is an added insurance benefit that can allow you to receive a lifetime income WITHOUT annuitizing. The advent of income riders has opened a gusher of annuity sales for insurance companies and given annuity owners a breath of fresh air. They now can own a retirement asset that can both grow principal, AND guarantee a lifetime income.A good income rider on the right annuity can keep your financial plan flexible and secure. When choosing an income rider, look for the term “GLWB.” These letters stand for “Guaranteed Lifetime Withdrawal Benefit.” The GLWB is a form of insurance. There are other types of income riders, such as the GMIB. The GLWB is the least complicated and most straightforward rider. A GLWB income rider ensures that you will have a stipulated amount of income every month, like clockwork, for the rest of your life. Even if markets go on a terrible run and your principal is somehow drained, your lifetime income benefit remains intact, insured by the financial strength of the insurance company. This is what the GLWB—Guaranteed Lifetime Withdrawal benefit provides for. By deferring an annuity income rider into the future, your income can grow to be quite high and can cover both you and your spouse. It can be a great way to add pension-like income to your future. 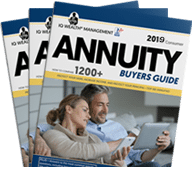 Annuity contracts have changed substantially in the past five to ten years, and dramatically since their introduction centuries ago. What started as a simple product to ensure a guaranteed income based on a lump sum investment became much more complex after the introduction of variable annuities in the 1980s. Before 1996, there were only three categories of annuities: immediate, fixed and variable. Then, in 1996, fixed index annuities were introduced, offering yet another annuity choice. Annuities are built for retirement — when safety of principal and reliable income take priority over speculating for wild returns. They are not made for the young investor but rather for the person nearing retirement or already there. Retirees have always struggled with the challenge of turning a lump sum of money into a lifetime income. Annuities are built to do just that. That’s why so many more people are rolling over their 401(k)s into annuity-funded IRAs. It is a logical choice. Why risk your principal and risk running out of money? But how does a person get enough income from an annuity when interest rates are so low? The annuities are a blend of investment and insurance. Your income is derived in part from your age, not just the interest rate. Annuities are built to pay income for as long as you live. It is an insured guarantee. In the old days — prior to the introduction of income “riders” — your only choice for turning your lump sum into a pension-like income was a process known as “annuitizing.” Annuitizing means exchanging your lump sum for a series of lifetime payments. Annuitizing is not a popular idea. Fewer than 10% of annuity owners actually go for the idea. So, imagine if you didn’t have to hand over your lump sum and could still get an income of 5% to 7% or more for life, guaranteed by a major financial institution? Enter the Annuity Income Rider, also known as the Living Benefit Rider. When it comes to your retirement, there is one nasty outcome that tops all others: running out of money. Studies tell us that eight out of 10 Americans fear it more than they fear death, including 72% of millionaires. Living benefit riders offer contract holders a predefined guaranteed payout during their lifetime, regardless of what happens with the stock market. You can add a rider to a variable annuity or a fixed index annuity, but not to an immediate or fixed annuity. Riders on variable annuities typically are more expensive and may pay less income than riders on fixed index annuities. Some fixed index annuity riders pay more income than variable annuities. The demand for fixed index annuities with income riders is rising. The reason? Most retirees are seeking some form of principal protection, to go along with their income. Variable annuities place your principal at risk to the market. Riders are optional and generally are paid for by an automatic shifting of funds from principal into the rider account every year. The charge is typically about 1% annually. Some fixed index annuities have zero annual fees for the rider. Some variable annuities have income rider fees as high as 1.5%. One reason I recommend uncapped Fixed Index annuities over variable annuities is that rider costs are much lower with the Fixed Index. Also, with fixed index, the rider charge is the ONLY fee deduction. If you don't need or want the rider, there are no fee deductions whatsoever. What Type of Rider Should You Choose? Sorting out riders is often done for you by the insurance company, so don’t throw up your hands in frustration. It’s easier than it looks. Most riders today are GLWB's--Guaranteed Lifetime Withdrawal Benefits. They are the most simple and straightforward. 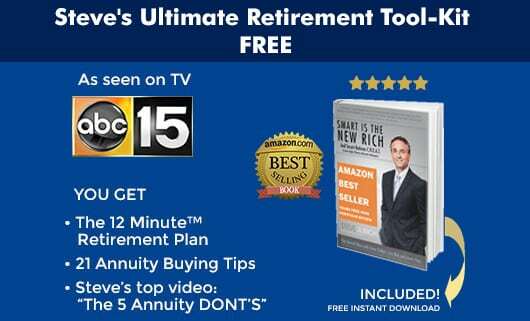 After 20+ years on the annuity business, I can recommend looking no further. Sticking with GLWBs gives you every advantage that the other types offer, but with less complication. You DEFINITELY want to avoid the GMWB if possible, for the reasons listed below. Most living benefit riders are designed to provide lifetime income withdrawals at a set rate — even if the principal falls to zero. That is the whole idea of having a rider — it is income insurance. But be careful; some variable annuities have riders that may not last your whole lifetime — known as the GMWB. By and large, fixed index annuity income riders use GLWBs, which are for life. 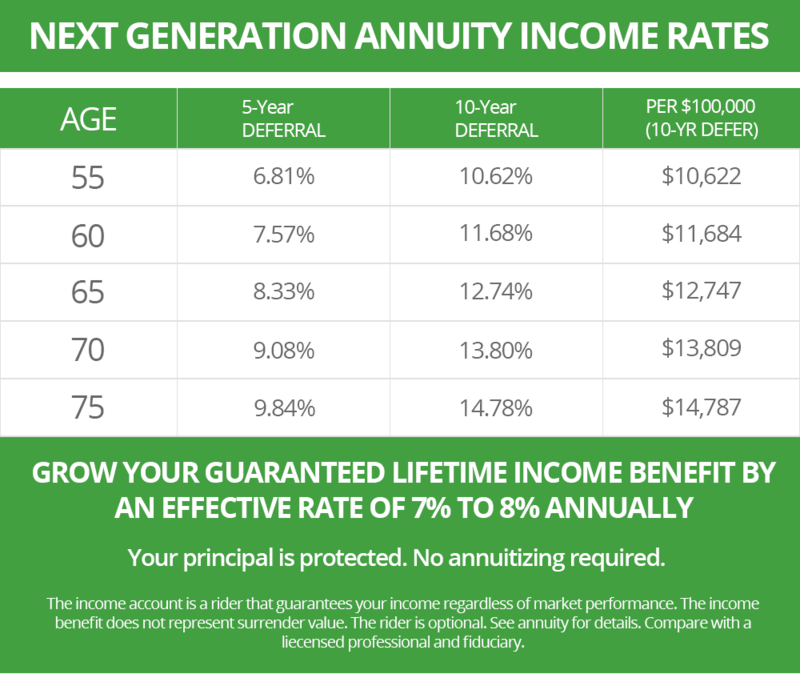 The smart annuity investor will look for the best income at the lowest cost that DOES NOT require you to annuitize, yet still guarantees an income for life — even if your principal runs out. The guaranteed minimum income benefit (GMIB) rider requires that the investor annuitize before receiving the benefit and may also include time and age limitations. The GMIB provides a set lifetime income upon retirement in exchange for giving up your principal. Investment performance is not a factor. Rather, payment relies on either the contract value or the investment amount plus an interest rate between 1% and 4%, whichever is greater. The assigned interest rate is either simple or compounded, and is used to provide a basis for calculating the investor’s payments. Unfortunately, many people who hear about annuity income riders are presented with this version of rider, which has limitations that most other forms of riders do not have. The guaranteed minimum withdrawal benefit (GMWB) rider allows the contract holder to withdraw a certain percentage of the investment amount yearly, without considering market performance, until he or she depletes the entire investment amount. Strong investment performance results in excess funds at the withdrawal period’s end. Poor performance may deplete the value, but the investor may continue making withdrawals until he or she recovers the full original investment. A decision to terminate the contract before the withdrawal period ends results in payment of the contract’s cash value. The step-up feature guarantees higher withdrawal amounts when investments do well over a certain period of time, such as annually or every five years. Typically, the amount withdrawn in a GMWB falls between 5% and 7%. The investor may not increase the amount withdrawn one year simply because he or she withdrew less the previous year. However, deferment of withdrawals followed by a growth in account value may result in larger subsequent withdrawals. The guaranteed lifetime withdrawal benefit (GLWB) rider allows the contract holder to withdraw a certain percentage of the investment amount each year of his or her life. The amount usually ranges between 3% and 5%, with the contract holder’s age being one of the determining factors. Other factors include whether the guaranteed payment covers one person’s lifetime or includes a second individual. In the event of catastrophic illness or confinement to a care facility, long-term care protection riders allow contract holders to withdraw funds without penalties, so long as he or she meets certain conditions. The Pension Protection Act of 2006 inspired a series of investment products combining annuities with long-term care. Since 2010, distribution of annuity assets with long-term care riders is tax-free, so long as certain criteria are met. Previously, these withdrawals faced a 10% penalty. Living benefit riders offer a way to fortify the fixed income portion of your plan for retirement. They offer a specific defined benefit attached to your annuity, which adds an extra layer of protection. The most important aspect is that your principal may grow or shrink over time, depending on markets and interest rates. But your income will not go down. Because your income is guaranteed, you are able to draw up a written retirement income plan, and know that you can stick with it. The funding of the benefit typically is a deduction from principal every year in the range of .5% to 1.2%. Because all owners with the benefit are paying into a pool of audited capital, the benefit has source of funding, much in the same way as a pension plan. Income riders for your fixed index or variable annuity are optional, and some fixed index annuities come with built-in income insurance, with no annual deduction from principal. Our team can help you compare all riders and help you understand them clearly before you settle on the right annuity for you.